The Roadmaster Guardian rock shield is crafted from rotationally molded, high impact Polyethylene to absorb the impact of rocks, gravel, and road debris, instead of ricocheting it back to the motorhome. 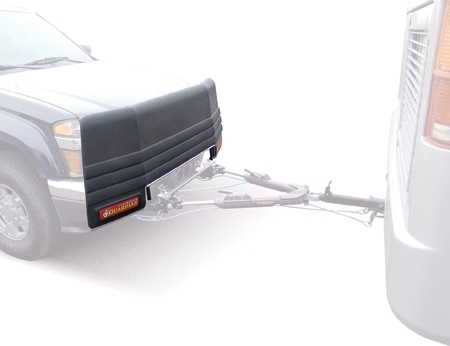 The Guardian rock shield can be attached and removed in seconds, and fits all Roadmaster tow bars equipped with Quick-disconnects. Can also be used with a tow dolly to help protect your towed vehicle by using Guardian bracket part number RM_2000-8. Roadmaster also offers a second vehicle kit with all the necessary hardware to to swap the Guardian from one vehicle to another. Note: MX, MS and EZ5 brackets will not accommodate the Guardian rock Shield.